Home > Animal Shelter Volunteering > Animal Fostering > Dog Fostering > Fostering Dogs Questions: How do you pick your foster dogs? 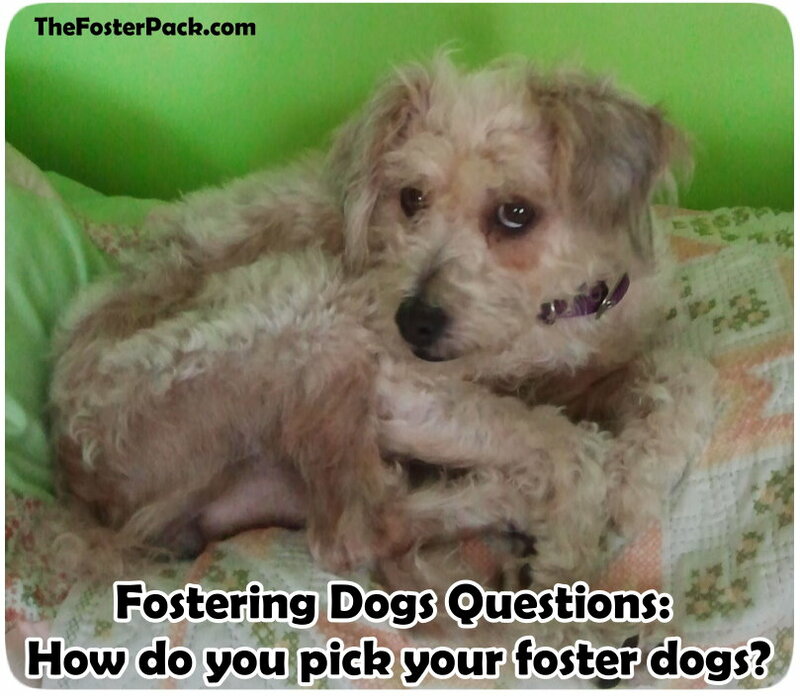 Fostering Dogs Questions: How do you pick your foster dogs? Fostering Dogs Question: How do you let your foster dogs go? How do you handle all of those dogs and foster dogs too? How do you pick your foster dogs? We don’t really “pick” the fosters. I’m sure lots of foster families do though. The animal rescue groups that I work with know the limitations I have with my pack. Male foster dogs can’t be much more than 30 pounds or so because Jackyl doesn’t take well to bigger dogs. Females we can go a little bigger, as he seems to like girls of all sizes, but males, no. And my house is not dog proofed for bigger dogs. We learned that with our litter of Golden Retriever mix foster puppies this winter, as they outgrew the adult dogs in the house. No more Jack Russells. For some reason, our pack also doesn’t take to well to other Jack Russell Terriers. Although there are four, Jackyl, Santana, Pantera, and Monkey, in our pack. Other than those two basic guidelines, we take pretty much whoever they need us to take. We’ve fostered lots of breeds, from smaller border collies to tiny little chihuahuas, and everything in between. I usually get a text and a picture of a dog needing a foster home, and I reply yes or no. Although we rarely turn down a dog, unless it doesn’t fit with the rules above. I can’t imagine having to go to the shelter and choose who to foster. I was asked to do that for my first time fostering. They kept bringing out dog after dog after dog. They were all so cute and scared, and I couldn’t choose. I finally just told the rescue group’s president that she had met all of my dogs, and to give me the dog she needed a foster home for the most, that would fit in with our little (at the time) pack. It turned out to be our Pantera, although at the time his name was Sanchez. He was our first foster failure, so she did good picking one out for us. His brother, Santana, was our second, and second failure. So for us, picking isn’t really a problem. If they don’t really need us for anyone, then I try to take the dogs that have been in the shelter the longest, that still fit our dog restrictions. Even if it’s just for a short while, it gives them a break from the stresses of the shelter. So if you’re looking to become a foster family for your local shelter or animals rescue, come up with your own guidelines. Then let the shelter director or animal rescue group foster coordinator know any restrictions and they’ll usually be able to find a lonely, homeless dog who fits the bill. Have a question about fostering dogs that I didn’t cover? Leave a comment asking, and I’ll do my best to answer it. Fostering really is a great experience, whether you have dogs of your own or not. It’s very rewarding to watch your foster dogs come out of their shells and show you their true personalities. Fostering Questions: What are you Expected to do as a Dog Foster Family? Which do you Prefer to Foster, Puppies, Adults or Seniors?